This 6U vertical server cabinet offers a space-saving way to keep your network and server equipment secure. With its 30 in. depth and a weight capacity of up to 200 lb. 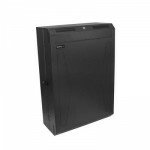 (90.7 kg), the server rack/cabinet is designed to fit your needs. It also features an additional 2U mounting bracket positioned toward the top of the enclosure, that you can use to mount patch cables or other shallow rack-mount equipment. Wall-mount your equipment, even if you donâ€™t have enough space for a full-sized rack or cabinet. This low-profile server cabinet is perfect for areas where space is at a premium, such as an office. The cabinet saves space by extending only minimally from the wall and housing the length of your equipment vertically. This reduces the horizontal footprint of your equipment while still providing plenty of room for your servers, patch panels, and switches. The RK630WALVS is backed by a StarTech.com 5-year warranty and free lifetime technical support.